'The director offers little introduction or exposition during the first act, opting for a free-wheeling shooting style which suits the fast-paced teenage antics of her cast perfectly'. My knowledge of sport in general could be written on the back of a particularly small postage stamp with a fair amount of room still available afterwards. My knowledge of skateboarding in particular comes from playing Tony Hawk's Pro Skater 2 not very well on a briefly owned PS One at some point in my mid-to-late teens. All of which on paper should add up to Lords Of Dogtown - a biopic focused upon the Z-Boys, the skateboarding team who would come to revolutionise the sport during the second half of the 1970s - being a film unlikely to be my particular leaf-infused beverage. That Catherine Hardwicke managed to have me transfixed from very early on is therefore testament to just how successful Lords Of Dogtown is in a great many ways. The director offers little introduction or exposition during the first act, opting for a free-wheeling shooting style which suits the fast-paced teenage antics of her cast perfectly. The grainy yet vibrant cinematography of Elliot Davis offers a Luhrmann meets Scorsese vision of the Seventies, remaining distinct and authentic whilst Davis and Hardwicke convincingly filter the decade through the contemporary skater culture of the early 21st Century. The soundtrack meanwhile is pure Tarantino in execution, with classics and cult favourites deftly cherry-picked throughout to create a bumper jukebox of period rock. 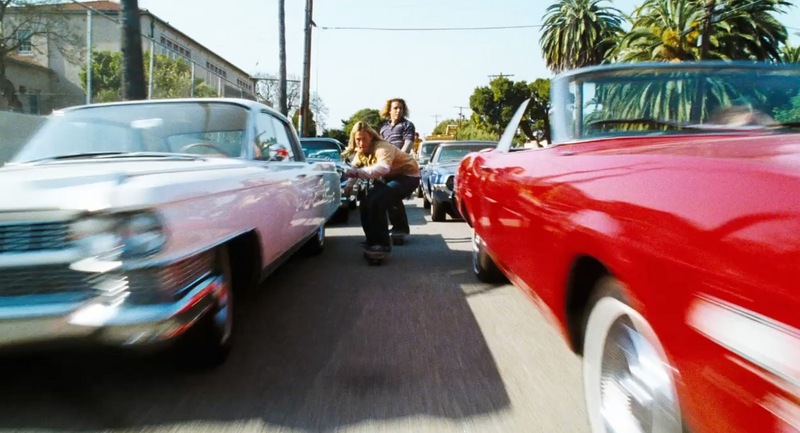 Hardwicke tells the story of the four-wheeled revolution instigated by the Z-Boys through the collective coming-of-age tales of Stacy Peralta (John Robinson), Tony Alva (Victor Rasuk) and Jay Adams (Emile Hirsch) in particular. It's a wise choice which constantly lends Lords Of Dogtown a sincere intimacy, allowing the social and cultural change of the time to subtly unfold around the young men at the film's centre. The script does suffer from occasional lapses into cliché, particularly when dealing with adolescent romance. When you take into account that the screenplay was penned by the real life Peralta, it also feels a little suspect that Stacy is put across as particularly squeaky clean in comparison to Jay and Tony. However, the impressive performances from all involved ensure the film overcomes any such problems - even Johnny Knoxville in a minor role can't derail matters. Lastly, it's impossible to mention the cast without commenting on Heath Ledger in support as Skip Engblom, the man who created and sponsored the Z-Boys as a team. Nothing more needs to be said about Ledger's performance, other than it provides yet another reason why it remains so heartbreaking that such a natural talent was lost by the film community far too soon. Lords Of Dogtown is released in the UK on Dual Format Blu-ray & DVD on Monday 5th December 2016. Heath Ledger and Emile Hirsch are the best things in the film but I think the story was better told through the documentary Dogtown & Z-Boys which was about that team of skateboarders. Lords of Dogtown just didn't work for me in comparison to the documentary which is one of my all-time favorite docs. I'd not heard of DOGTOWN & Z-BOYS until just after watching LORDS OF DOGTOWN, but the latter made me want to seek the former out a great deal. I agree Ledger and Hirsch are the best of a comprehensively strong cast; but to me Hardwicke's film is less about documenting the Z-Boys as it is creating the essence of the time and place they lived in. The first act, where the narrative takes a firm back seat to the artistic and cinematic elements, is arguably the best; the film loses something the more conventional it becomes in telling the story. I didn't know what to expect from Hardwicke's film but I had an absolute blast with it. Plans to watch DOGTOWN & Z-BOYS will definitely be stepped up following your recommendation though!